This super thin and flexible HDMI cable has been specially designed for connection to devices in confined spaces or with restricted access to the HDMI ports. 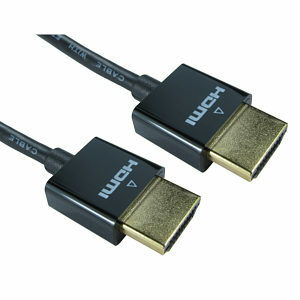 The small form factor connecting housing and thin wire HDMI cable construction is perfect for connecting to awkwardly placed devices in a rack or to displays mounted close to a wall. Super Fast 10Gbps data rate with HDMI 1.4 equipment and 18Gbps with HDMI 2.0, compatible with HDMI 2.0 equipment and older versions.